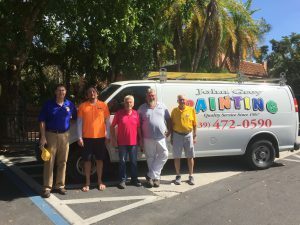 John Grey Painting returns as a Platinum Sponsor of the Sanibel Captiva Lions Arts & Crafts Fair held inside and on the grounds of the Sanibel Community House. In its 35th year, the fair will be from 9 a.m. to 5 p.m. Friday, March 16 and 9 a.m. to 4:30 p.m. Saturday, March 17. John Grey Painting is celebrating 50 years of business in Southwest Florida. John began painting and learning construction in the late 1960s when his parents bought and refurbished a two-story beachfront hotel on Fort Myers Beach. Painting and construction remain a family trade handed down to John’s two sons, Nate and Derrick, initially employees now equal partners in the business. “We are proud to be a part of something our father built from the ground up, and hope to carry on his mission of providing a total quality experience,” said Nate. John Grey Painting is best known for its decorative Faux finishes, murals and patterned floors. They provide services to commercial and residential clientele, including full interior and exterior carpentry, sheetrock and stucco work. The Arts & Crafts Fair is a long-standing island event showcasing the works of more than 100 talented artists and crafts people on the Community House grounds. Inside, there will be numerous silent auction items ranging from pieces by local artists, restaurant and jewelry gift certificates and much more. Money raised through the fair will go towards various Sanibel charities, vision and hearing based charities and local scholarships. The Lions meet on the first and third Wednesday of each month at 6 p.m. at the Sanibel Community House. Visiting Lions welcome. For more information on Lions or the fair, visit sanibelcaptivalions.org. Contact John Grey Painting by phone at 239-472-0590 or visit their office, 695 Tarpon Bay Rd., Sanibel.